Recently I have encountered several people who are in distress because they don’t feel that they are doing some aspect of their spiritual life correctly. They experience stress, depression, fear, even trembling and extreme anxiety because, for example, they fear they aren’t fasting correctly, or are not believing completely in the resurrection (or incarnation or the authority of the Church), or are not confessing well, or are not attentive enough in divine services, or are inconsistent in their daily prayers, or often have to expel wicked thoughts from their minds—the list could go on and on. These are all common temptations or struggles of those who sincerely give their life to God. Yes, some struggle with one thing, while others struggle with something else. Like in the Special Olympics, each athlete has his or her own specific handicaps. Thank God that He does not allow us to be overwhelmed with everything at once. That we weak human beings should struggle in some areas of the spiritual life should be no surprise for us. We are beginners. We are beginners with serious handicaps—it’s like we are newly enrolled in the Special Olympics of the the heavenly life. A young woman with Down Syndrome will need lots of extra help and patience with herself to learn how to throw a discus well. Similarly, we need not be surprised when, again and again, we have to go through the same motions in our spiritual life, seeming to make the same mistake over and over again. We are learning. God is helping us. Yes, we are spiritually handicapped in some pretty serious ways, but our coach is God—and God is the best, most patient coach. The divine power teaches him just as a man teaches a small boy to swim. When the boy begins to sink, the man raises him up, because the boy swims above the hands of his teacher. And when he begins to grow fearful that he will drown, the teacher who holds him in his arms cries out to him encouragingly, ‘do not fear, I am holding you!’ And just as a mother who, in teaching her little son to walk, steps back from him and calls him, and as he comes toward her on his little feet he begins to tremble and is about to fall by reason of their softness and delicacy, and she runs and catches him in her embrace, so the grace of God also embraces and teaches [those] who purely and with simplicity have surrendered themselves into the hands of their Creator, and have renounced the world with their whole heart and follow after Him. We are the babies with soft and delicate feet. 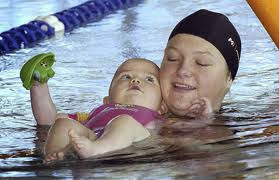 We are the ones learning to swim above the hands of our Teacher. You know, I think that the devil’s attack is not so much in the fact that we struggle to pay attention in divine services or struggle with doubts or seem unable to fast very well. I think these are merely the stumblings of a beginner, the stumblings of a handicapped beginner in the spiritual life. Where I think the devil’s main attack lies is in our anxiety and frustration over our apparent lack of progress in the spiritual life. This is the main dart of the evil one, the poisonous dart that can do real damage. When we allow ourselves to become frustrated with our slow progress (or apparent lack of progress), we are subtly giving place to pride. We are thinking that we should be better than we are, that we should be able to just make ourselves do it (whatever the ‘it’ may be). It reminds me of a young man I knew with autism. Whenever he became frustrated that he couldn’t communicate what he wanted, he began hitting himself in the head. In my struggle with spiritual things, I have sometimes treated myself the same way. When I became frustrated that I just couldn’t pray (or love or be kind or patient) like I wanted to, in my frustration I would push myself in ways that were not healthy and in the end in ways that sometimes turned out to be destructive. Somehow I didn’t want to simply trust that I was swimming above my Teacher’s hands. Somehow I just didn’t want to accept that my feet were soft and delicate and my heavenly Mamma was running to catch me ‘in Her embrace’. So what if I have spiritual autism? So what if I have a serious spiritual handicap? Does God love me any less? Of course not. In fact, we might even say that he loves the handicapped more, because they need more love. (Although theologically speaking, God’s love is the same for everyone, it never changes because God never changes.) The problem lies not with God or His love, but with me and my willingness to rest in His love. Martin Luther said that faith was like learning to swim in the middle of the deepest ocean. I think he was right. Only we are not learning to swim alone. We are above the hands of our Teacher, and if we will just relax a little and trust His love, we will learn to float above His hands. And once we learn to float, we can begin to swim—but always above His hands. Maybe that is our problem. Maybe we want to be swimming when we still haven’t leaned to float very well. Maybe like the girl with down syndrome, we have to keep going back to the fundamentals: hold the discus this way, put your feet here, twist with your hips this way. Or like the boy learning to swim we have to keep reminding ourselves to float, to trust, to relax and know that God’s hands are holding us up. Or like the baby with ‘soft and delicate feet’ we take our feeble steps knowing that God, like a heavenly Mother, is running to us to catch us even as we fall again, running to catch us and to hold us in His loving embrace.